What a horrifying tragedy! It is a good thing Boeing 737 Max 8 planes have been grounded worldwide. I would not fly in one if my life depended on it! Quelle tragédie horrifiante ! Heureusement, on a mis à terre tous les avions Boeing 737 Max 8 à travers le monde entier. Moi, je n’irais jamais en avion dans celui-ci si ma vie en dépendait. In 1370 B.C., the volcano at Thera erupted in a massive explosion, and even though it was far away from Knossos, it set off an earthquake which utterly destroyed the city. En 1370 av. J.-C., le volcan à Théra a éclaté dans une explosion massive. En dépit de la grande distance entre Théra et Knossos, le volcan a déclenché un tremblement de terre qui a entièrement détruit la ville. On 24 August AD 79, the volcano Mount Vesuvius burst out in a massive explosion which completely buried the city of Pompeii in ashes. At first, lava rained down the city, followed by an ash storm with massive lightning which killed almost everyone in the city. It is one of the worst natural disasters in all of history. Le 24 août 79 ap. J.C., le volcan, le Vésuve, a éclaté dans une explosion massive qui a complètement enterré la ville de Pompeii en cendres. Au début, la lave s’est versé sur la ville, et ensuite un orage de cendres accompagné de coups massifs d’éclairs a tué presque tout le monde dans la ville. C’est une des pires catastrophes naturelles de l’histoire. 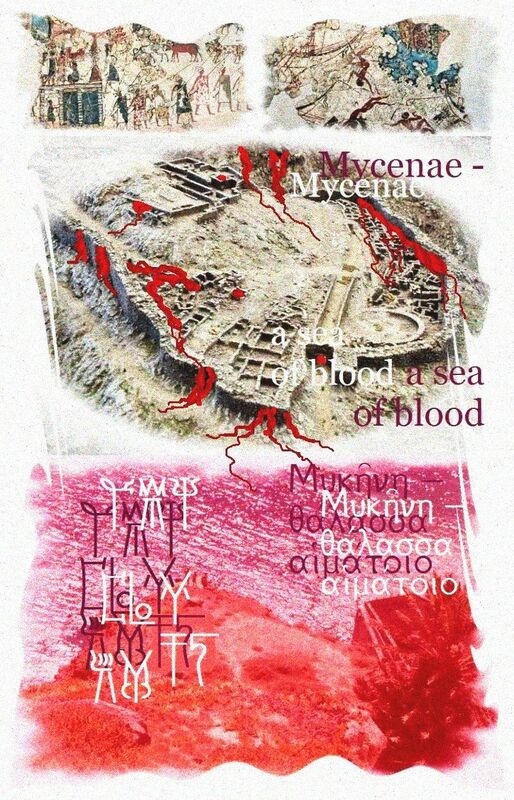 We do not know the actual circumstances of the fall of Mycenae, but we can well imagine the massive destruction of the great citadel, and the sea of blood that must have poured though it as 1,000s of citizens were mercilessly slaughtered – hence the massive spill of blood into the Aegean Sea. Reminds one of the fall of Troy. Note that I am using the archaic Homeric genitive ending in OIO.